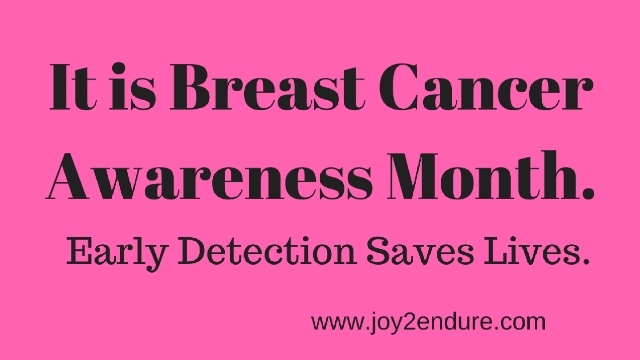 A Warrior’s Musings: How I Dealt with My Breast Cancer Scare. It was seven years ago, after I had just completed yet again another hospital leg marathon which I have blogged about here and here. I was full of hopes, determined to get that job which could take me off the rank of CEO of Chomecam aka unemployment. I started compiling and depositing my documents here and there praying and hoping at least one interview call would come in. And so I waited and while I waited, I had to think health. While laying flat on my bed one day, I decided to do my breast self exam. That was how I felt a lump like something slightly painful on my left breast move. My heart skipped a beat, then took on an increasing crescendo and flopped into my stomach. I felt my breast again and again and still the lump was there moving. Being the medical novice that I am, my heart was racing and I was like Papa God not this one too! The next day, I booked an appointment with my doctor. He gave me a rendez vous within the week and I was sent to see a Radiologist. It was not easy to meet this Radiologist. It was a typical upandan the hospital corridors for the next couple of days until I saw the Radiologist who asked that I do a mammogram. I went for the mammogram heart beating. I had to wait a couple of days more to get the results. Fear and all, I wasn’t just going to sit and wait. I did not have home access to the internet and mobile networks were not common. And so every day, with my little cash, I was in a cyber cafe reading all I could about lumps on the breast. My findings showed most often, women could have such lumps but they were not necessarily cancerous. These findings helped calmed my scattered nerves a bit. Still, I was weary of what the mammogram result would show. I received the results with no explanations except to take it back to my Dr. Now, My Dr is a paediatrician concerned with sickle cell research. There was no way he was going to study that result and tell me what to do. He sent me to a renowned Gynaecologist/Obstetrician. It was another struggle to see this Dr. When I finally saw him he didn’t even take the time to study my file or medical history he just asked me to prepare for an operation. I tried to ask him why an operation? I mean it is my body I at least have the right to know why they have to cut it open. This Dr refused to give any plausible reason why I should be operated. Thankfully, I have never been the one to follow Doctor’s words as the ultimate gospel no matter how much respect I have for them. So I asked myself several questions why does this man want to operate me even without taking the time to understand my medical history? Being a high risk patient, were there no alternatives to determine if truly that lump was cancerous before going the operation route? I do know that operations are usually the last option for people like us. So I just couldn’t buy this Dr insisting on operation. I decided to seek a second opinion with another Gynaecologist/Obstetrician. In the mean time, the cyber cafe wasgetting richer from my daily visits. I read everything possible, determined to find out if operations were necessary. My Dr nephew tried to calm down my nerves and referred me to another OB/GYN. The manner with which he took his time to explain the situation to me, did an exam before asking for another mammogram test left me so relieved that I had to say truly, some people are called for some specific professions. After this second test and opinion, the Dr told me to apply one topical balm and come back in a few weeks. The results showed the lump was not cancerous. After the follow up, a new breast exam was done and I was told to go home and not worry. My Dr preferred the opinion of the Dr who asked for an operation. There was no way I was going to accept operation based on the opinion of a Dr who didn’t bother understanding my medical history no matter how renowned he was in his field. My next step was to search for someone with this Dr’s calibre and seek his opinion. Thankfully, he was the mentor of the second OB/GYN I consulted. The situation was explained to him and why I needed a third opinion. He asked that I do one final test which would determine which route to take. I went for the test and thankfully, it came out negative and today, 7years on, there’s no lump felt around my breast. Some take home lessons from this experience was that, it is always good to seek a second and if possible a third opinion especially if, your gut feelings tell you there might be some rush in a form of treatment that may not even be necessary. Some Drs have been known to carry out unnecessary operations all in the name of cash. Secondly, it is always good to ask questions and keep yourself informed about issues pertaining to your health. Drs are trained and are there to guide us. However, their words must not always necessarily be gospel. If a Dr is not ready to explain to you the reasons for certain procedures nor calm or alleviate your fears, you have to rethink other Drs and options. And finally, my fears and worries were not unfounded. There are actually some warriors who battle cancer in addition to sickle cell. Situations like these make one fear that is why it is important to see a Dr as soon as you notice anything abnormal if only to calm your nerves and avoid full-blown crises borne out of unnecessary worries. Thank God for critical thinking and daring to ask questions. It saved me unnecessary scars and needless worries. Prev From Wheelbarrows to Stalls…Why It is all About Survival. Next Debunking Myths 4: Ten Misconceptions about Sickle Cell Everyone Should Know. Lol at you were making the cyber cafes richer. Na wah for that doctor who wanted to just operate you with no explanation. Shaking my head for him. Trust you to get to the bottom of issues before taking a decision. I’ve been meaning to come catch up here in a long time. Thanks for the awareness, sis! Massa oh Cyber Cafe was only getting rich lol. The Doc is just an example of many who carry out unnecessary operations. A geh has got to think twice. Thanks for catching up sis. I have missed you here.